The new Countryman looks a lot like the first-generation model, which is to say, a bigger, chunkier interpretation of the BMW-era MINI’s now-familiar design language. Notable changes from the first-generation car, which had been on sale since 2010, include headlamps that are encircled by daytime driving light-rings, and more prominent grille and side scuttles. The paint finish here is ‘Melting Silver’, which costs an extra C$590 in the Canadian market. The plastic cladding around the arches blends in nicely and stops the lower-rear door corners from damaging your neighbour in a tight parking lot. As with all MINI models, there are details galore to catch the eye. The projection of the MINI crest downward from the driver’s door mirror, standard on all models, is a fun touch. Our test car was finished with discreet, 18in, black pin spoke alloys and runflat tires (C$200) and LED head- and fog-lamps (C$1400). LEDs aside, the fog lamps are in the aptly named Essentials Pack (C$1,450) that also gives you heated front seats, an adjustable rear bench, rear central armrest and panorama sunroof. The black wheels were complemented by black hood stripes, roof rails and darkened rear glass (all cost-options) and black roof and mirror caps (free). Design details abound inside the car, too, although they sometimes blur the line between neat and gimmicky, depending on your preference. The trademark, oversized central display is surrounded by pulsing LEDs that indicate switches between the three drive modes and kick in with the automated stop-start system, which works seamlessly. Perhaps it’s the Brit talking but for me, the liberal use of Union Jacks jarred a little. BMW bills MINI as a “British premium brand” but this car was engineered in Germany and is built by VDL Nedcar in the Netherlands! The Countryman gets the basics right, though. The ‘carbon black’ leather seats (MINI Yours Leather Lounge, a C$2,250 option) are comfortable, front and rear. There’s plenty of leg and headroom in the bright and airy cabin, too, and cargo space is up 30% over the old model. The major controls fall nicely to hand and it’s easy to find a comfortable driving position. I was impressed with the voice-command programming for the GPS (Wired Navigation Package including a larger, 8.8in touchscreen, C$1,200) and the optional Harman-Kardon infotainment system (C$750). The head-up display (C$750) was also helpful, although its adjustment unhelpfully required delving into a fifth submenu of the (easy to use) MINI Connected control interface. You’ll have by now noticed a recurring theme: the Countryman has lots of great features, but almost everything is a cost-option. BMW and MINI have operated successfully this way for years, but it remains a frustration to this reviewer that if you want anything resembling a sensible specification on a vehicle that’s already supposed to be “premium”, the base price bears no relation to what you’ll ultimately pay. By way of example, my highly specced UK test car sold for a heady £40,045 (around C$70,000), some £9,000 above the list price. In Canada, adding a comparable level of equipment to a Countryman Cooper S ALL4 adds 50% to the C$32,290 base price. 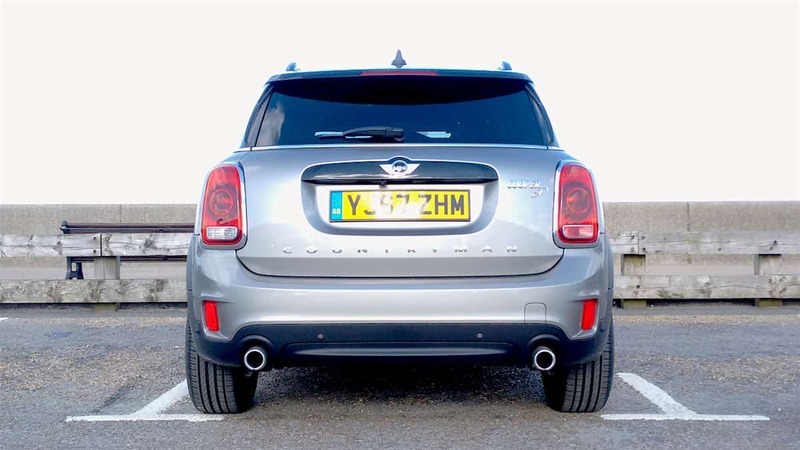 Be sure to compare like with like when considering the Countryman against its rivals. Still, you don’t buy a MINI because you’re looking for a value-priced vehicle. High-quality fixtures, endless personalization options and BMW brand cachet are all part of the appeal, as is a fun-to-drive factor that evokes the spirit of the 1950s original. Unfortunately the first-generation Countryman fell well short in that regard, in particular being prone to tramlining – following the camber of the road rather too closely – and an unsettling pointiness around the straight-ahead, which combined to make it rather less fun to drive than you’d have hoped. It’s heartening therefore to report that the new Countryman is a different animal altogether. Key to its dynamic improvement are the use of BMW’s UKL platform, which also underpins the latest X1, and recent advances in BMW’s beloved runflat tires, which at last rival conventional rubber in ride and handling performance. The tires fitted to the test car were Pirelli Cinturato P7s. Even with the extra weight of the diesel lump up front, the ride comfort was so supple on some typically poor British road surfaces that I found myself double-checking the tire specification. The days of runflats’ stiff, reinforced sidewalls compromising even the most sophisticated suspension, have clearly passed. Meanwhile I was grateful for the Countryman’s precise, intuitive steering on the narrow roads of the picturesque Isle of Wight. This isn’t a conventional hot-hatch, but it handles nicely when pushed along, enabling you to enjoy the 266 lb-ft of torque (59 lb-ft more than the gas engine) from BMW’s 187-horsepower 2-liter. The 8-speed Sport Automatic transmission (C$1,650 on the Cooper S) keeps the engine in the torque – mostly between 1,500-2,000rpm – while ensuring it remains smooth and quiet at speed. There’s paddle-shift if you can be bothered, which I couldn’t, mostly, and all-wheel drive for added security when things get slippery. Add in a claimed 5.1L/100km combined fuel consumption, and you’re left wondering whether North America is missing a trick in avoiding small diesels like the plague, and whether Europe is in danger of throwing the baby out with the bath water in its apparent, new-found desire to regulate diesels out of the mainstream in the wake of the Volkswagen Dieselgate scandal. When contacted, a MINI spokesman could not confirm nor deny the possibility of the Countryman SD coming to North America but there are several reasons why it is unlikely to make it to this side of the Pond. Low gas prices make the diesel motor’s extra cost and lower consumption harder to justify and Dieselgate has made the fuel a harder sell than ever, even in Europe. Fortunately for Countryman shoppers with an eye on the future, an alternative is already here in the form of the plug-in hybrid Countryman Cooper S E ALL4, although at C$43,490 you’ll pay a premium. For everyone else, I see no reason why the regular gas models shouldn’t be terrific, premium (and premium priced) transport: stylish, practical and good to drive. No wonder that Countryman sales jumped 30% worldwide in 2017. On the heels the Huracán EVO Spyder announcement, Lambo is shedding the roof on another beast — the Aventador SVJ, recently killing at the Nürburgring.